Shimano internal hub maintenance is pretty specific. You can't just throw any old lube in there like you can on an external drivetrain. When using Shimano Internal Gear Hub Maintenance Oil according to spec, you assure the proper maintenance and long life of your internally-geared Shimano hub. can the oil be reused? BEST ANSWER: No, the oil should be disposed of in an environmentally friendly manner after use. Is this the same oil as the Shimano S700 oil for Alfine hubs? 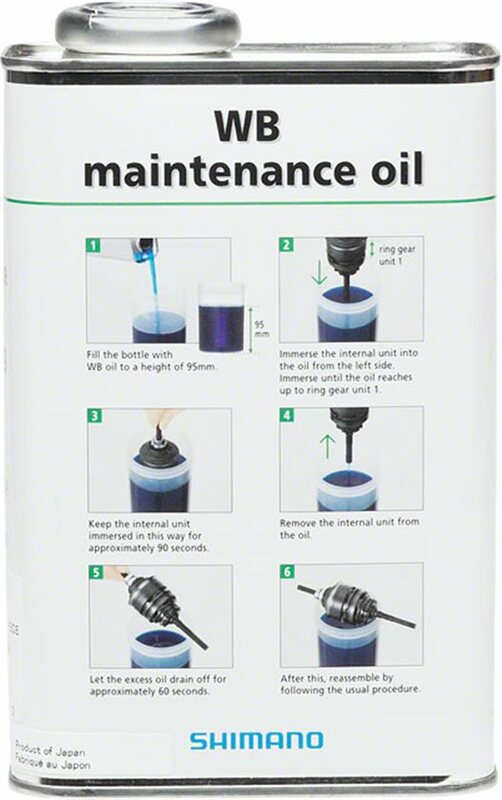 This oil is for aalfine 3, 7 and 8 speed alfine hub maintenance. The process required dissasembly, and dipping the gear stack in oil. Bearings will need grease on reassembly. S700 oil is for the, the 11 speed alfine hubs. The process included draining, flushing and replacing oil, without disassembly. you can google 'alfine hub maintenance' to find the Shimano maintenance documentation. Jenson sells the s700 oil in both single use, and 1 liter sizes.